Special Needs Archives | How Do You Do It? It is with a heavy heart that I must tell you that Marissa‘s son A, an inspiration to so many, passed away yesterday. He was just a few days from his fifth birthday, which his twin brother D will celebrate alone. Help us celebrate A’s life with The Barefoot Book of Children. A overcame hundreds of expectations that came with a diagnosis of a chromosomal deletion, learning to walk independently and brightening the days of those who met him. 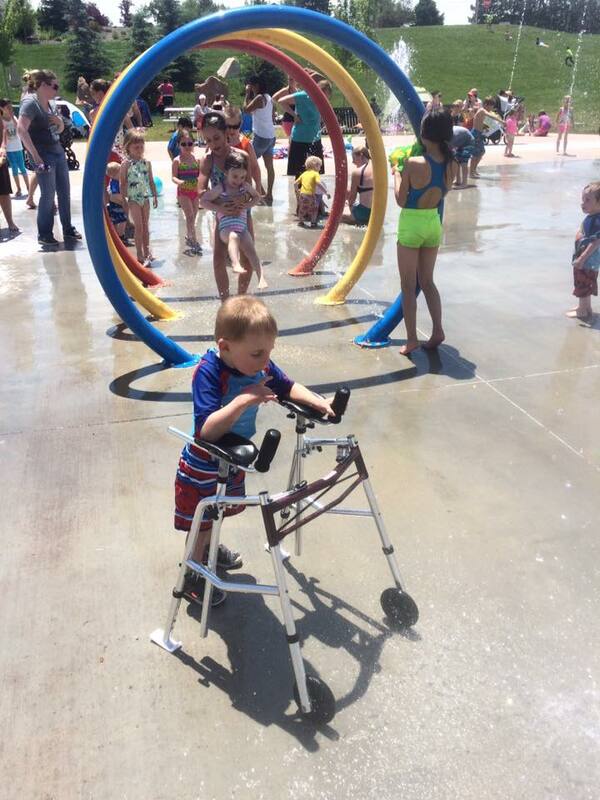 He was the inspiration for his mother’s efforts to bring accessible playgrounds to Utah. 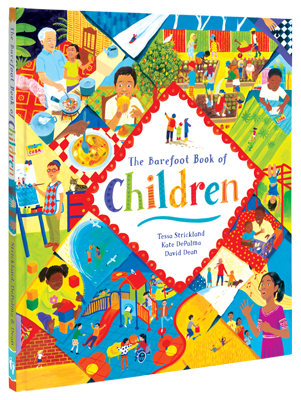 Marissa asks that we remember A by sharing with as many children as we can The Barefoot Book of Children. This book shows childhood in all its diversity: the able-bodied and disabled; the rich and the poor; the rainbow of shapes, sizes, cultures, languages, and everything that enriches our experience. In A’s honour, I am giving away one copy of this book to a reader. Please enter and share this far and wide. A’s life was cut short far too early, but his footprint remains. This giveaway ends on January 16, 2017. Adding to this tragedy, Marissa and her family lost their home yesterday in a fire. 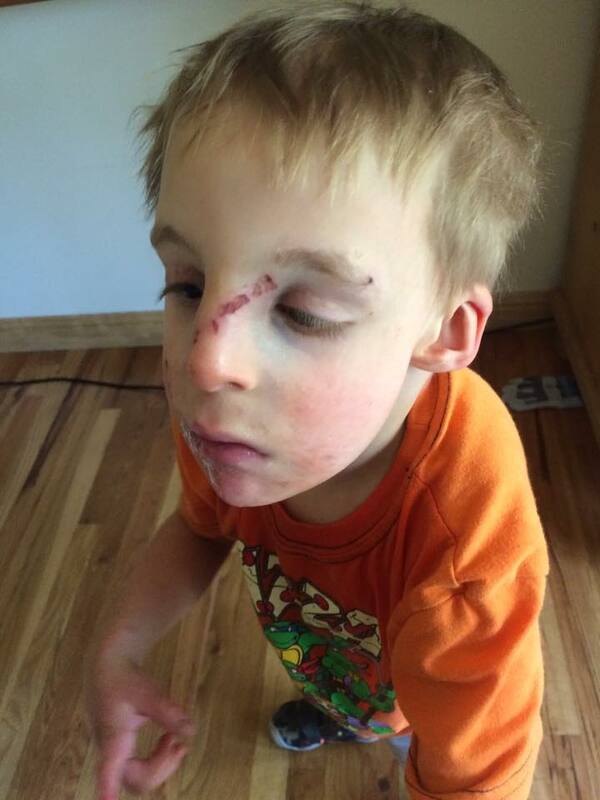 The two surviving boys and both parents are okay. Marissa smelled the smoke and was able to get the children out in time. However, their pets did not survive. Mementos of A—his baby things and supplies that could have blessed another special needs family—did not survive. The family cars did not survive. Marissa and David will have a lot of work ahead of them to bolster the children’s sense of safety, and all while they grieve A. Many generous people have stepped forward to help the Christenson-Lang family. I can’t even wrap my head around so much loss being heaped on one family. You can donate financially to help them rebuild for what is left of their family at Youcaring. 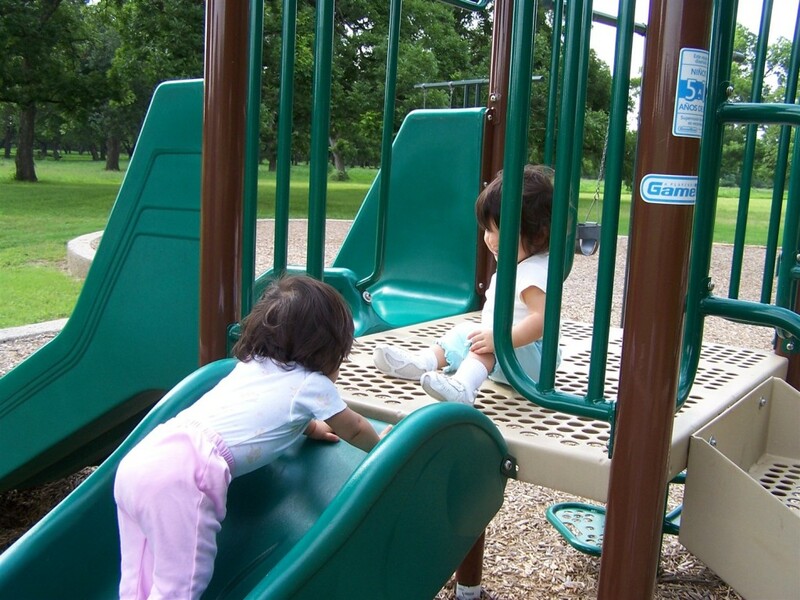 My girls and I have been going to local playgrounds since they were newborns. Wood chip ground cover was a nuisance when it came to getting around with my double stroller. I remember wondering how parents in wheelchairs managed. I used to leave one twin at a time in the stroller while I held the other in my lap. We slid down the slide to the sounds of peals of baby laughter. As soon as they were walking at about 12 months old (10 months corrected), my daughters toddled out onto the wood chips. Twin B was a little suspicious of this stuff under her feet. Twin A dived into it with gusto. My major frustration with the wood chips that lined nearly all the playgrounds near us was that my daughters liked to chew on them. Other children, though, find wood chips to be an impassable obstacle. It keeps them from being able to access the equipment at all. Marissa‘s son A has a variety of special needs. He has already overcome every expectation doctors set for him. They didn’t think he’d survive. When he proved them wrong, they didn’t think he’d be mobile. Untiring parents, committed therapists, and A’s will of steel keep showing us that the sky is the limit. A uses a walker to get around. When it comes to playgrounds, the edge of the wood chip ground cover marks the limits of where A can get around easily. Cement playgrounds aren’t ideal, but they are walker and wheelchair accessible. Wood chips catch on A’s walker, and he recently suffered injuries from a park fall. 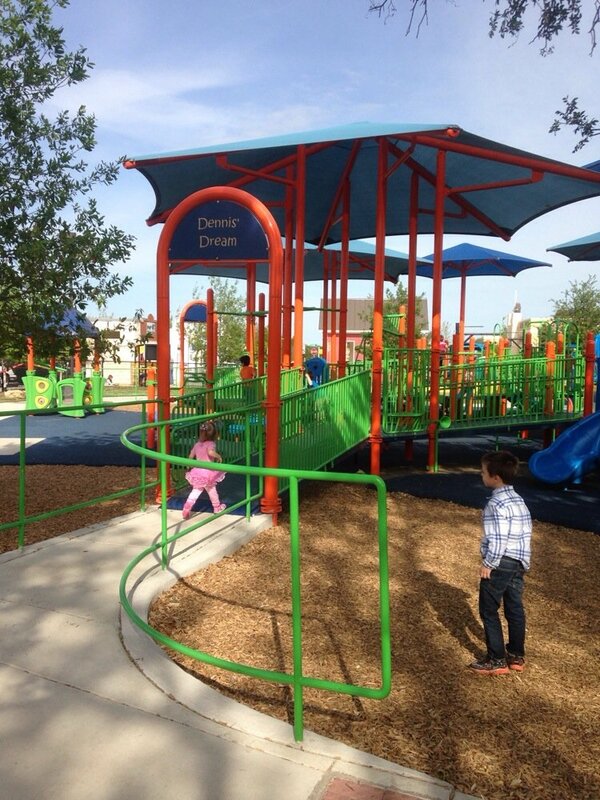 Here in the Austin area, the Play for All Park in Rabb Park is an accessible playground that is designed with kids like A in mind. It has a swing for wheelchair-users and ramps onto the playscape, tactile surfaces for blind kids, and the ground is covered with a firm but yielding foam-like surface. There are a few areas with wood chips, but much of the playground equipment is accessible. Unfortunately, nothing like this is (yet) available where Marissa and A live. Today, the Americans with Disabilities Act is 26 years old. If you can, please contact your local parks and recreation department and ask them to consider playground accessibility. Even paving part of a park would make it more accessible to kids like A. It’s a quick call for you, but a world of inclusion for A and children like him. If you have any photos or videos of a friend or family member trying to navigate wood chips, please email them to Marissa at hdydiblog@gmail.com. She will be using them to advocate for accessible playgrounds in Utah. 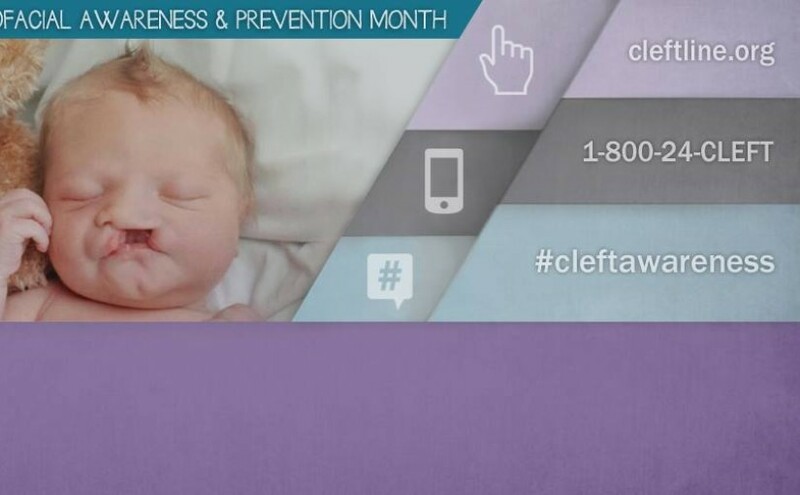 July is National Cleft and Craniofacial Awareness and Prevention Month! Find more #cleftawareness photos and stories on Facebook! On a beautiful Colorado day in June of 2012, my heart was racing with anticipation and excitement. Our long awaited second child was about to make his entry into the world! 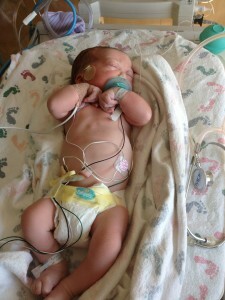 When he was born, he made no sound because his cord was wrapped around his neck…twice. They removed it and within moments, he was screaming his head off. It was like music to my ears! Moments later, the doctor informed me that our son, our Sweet Pea, was born with a cleft palate. While we knew that this was a possibility as I was born with one as well, it was still a blow. I had walked this road, and I knew of the struggles that he would face. He was admitted to the NICU for observation due to his difficult delivery, but ended up staying for 3 days because he needed oxygen. He went home with oxygen, and remained on it for 13 weeks. During that time, feeding became a major issue. Our son was born without any of his soft palate, and was missing some of his hard palate as well. 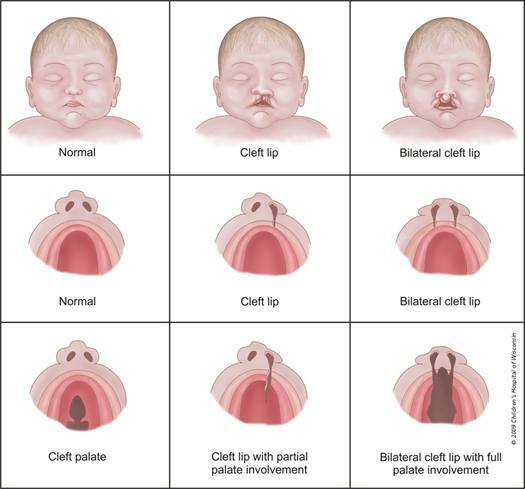 When people hear that we had cleft palates, they often say, “wow, you look so great!” While I appreciate the compliment, I realize that there is a lack of knowledge about clefts and choose to take these occurrences as a gift…an opportunity to raise awareness about clefts. 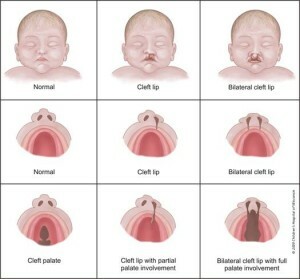 For Sweet Pea and I, we do not have complete clefts, meaning our lips were not impacted by our cleft (see the bottom left picture in the chart below). While cosmetics were not an issue, feeding, breathing, speaking and orthodontics are. Because his cleft eliminated his entire soft palate, he was never able to latch to breastfeed. This was a huge blow to me and contributed to my post-partum depression. At only 6 weeks old, Sweet Pea was diagnosed with failure to thrive. We tried several methods of feeding him before we found the Haberman feeder. It is now called the Medela Special Needs Feeder and just one costs about $30. Obviously, the ability to feed our son was priceless, but it was very challenging. 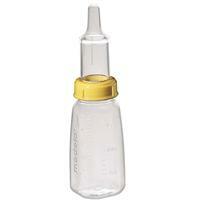 If it weren’t for this awesome bottle, our little man would have gotten a peg tube to feed him. Many children have their cleft palates closed around 6 months of age…unless they have a craniofacial anomaly that impacts their airway. 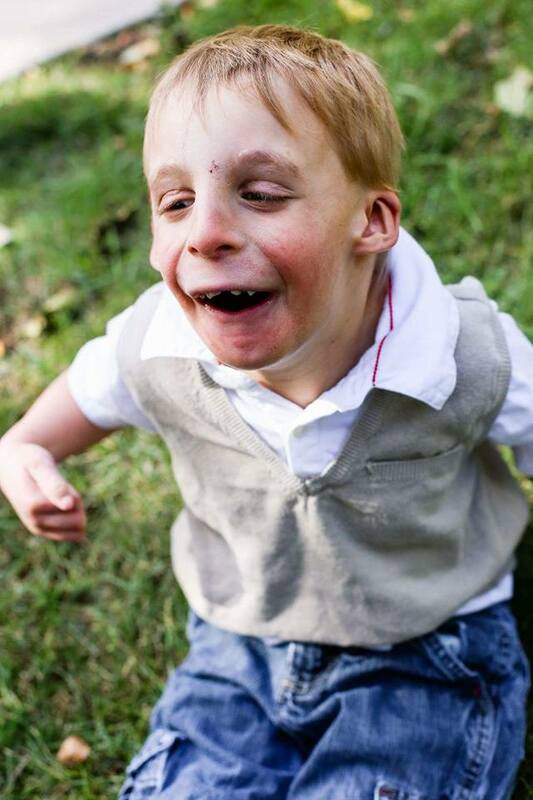 Our son also has Crouzon Syndrome, which makes his midface small, therefore making his airway small. Because of this, we had to wait until he was 12 months old before closing his palate. It was a long, difficult road, but well worth it! A cleft palate repair typically takes about 3 hours…P’s took 5. It was the longest day of my life. When the craniofacial surgeon came out, he told us it was the most difficult repair he has ever done, but he believed it was successful. Two years later, I can attest to that claim. So far, P has had three surgeries, and the only surgery on the horizon is replacing his ear tubes. Today his biggest challenge is speech, but he has an amazing speech therapist and he is a resilient guy. We will continue to have him monitored by his Cleft/Craniofacial Team on a yearly basis. While we cannot predict his future, we do have a good idea of what to expect from my own experiences. My hope is that this post will raise awareness about clefts and craniofacial differences, and that it will encourage parents who are on this road too. As someone who was born with Crouzon Syndrome, Craniosynostosis, Chiari Malformation, and a cleft palate, I can say that I am thriving today. My son has taught me a lot about myself, how I deal with our birth defects and how I view myself and him as we walk this path. He has taught me that I am his voice, his advocate and his cheerleader. Maybe he can teach others too? Do you, or someone you love, have a cleft? Would you like further information about cleft or craniofacial support and encouragement? Comment below or send a message! Sara is a mama of four children, two of them being surprise identical twin girls. She is happily married to the love of her life, stays home with her children and is currently homeschooling her oldest child. Most of her writing is centered around raising awareness about Crouzon Syndrome and cleft palates, advocating for your child, homeschooling and raising multiples. Find her blog at Confessions of an Outnumbered Mom. As a parent you will do anything to make sure your kids are safe and happy. With the first baby especially, you stress and worry and panic and wonder if you are ever going to do anything right. My oldest was an early talker, a very early talker and a late walker. I had always heard that you either talk or walk – that babies focused on one area of development at a time. She talked early and walked at 17 months. Perfectly reasonable and within “normal” ranges, so it is fine. Again, I stressed, I worried and I wondered if I would ever get anything right. Don’t get me started on sleep. 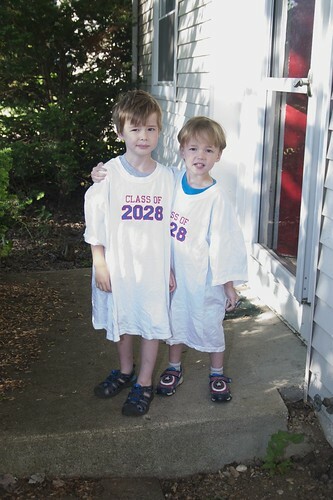 The twins are now 2 ¾ and we still have sleeping issues…. The boy girl twins, like my older daughter, were early talkers. And late walkers. Sidney walked at 17 months just like big sister. But Spencer did not. He did talk early but at 17 months was not walking. It is ok, he will get there. And at about 18 months he took 5 steps into my arms. And I cried and screamed and attacked him with kisses. He did not walk again. He did not even cruise. I called Birth-to-Three and after a scheduling nightmare I gave up and called the pediatric rehab center on my own. My mother-in-law came with me. Her job was to listen to everything I missed and hold my hand. She did great. Spencer did great. I did not. In my defense, I did not mesh well with the therapist. I am 100% positive she is very qualified and good at her job, but I constantly felt blamed. “If you don’t pick him up he will walk.” That comment had me in tears. And had Spencer in tears. I will never forget his baby arms reaching up for me and his baby screams while this (evil) woman tells me that he is not walking only because I pick him up. The therapist would hold toys just out of his reach and try to force him to reach for them to build up him muscles. Spencer would give up and move to a different toy. And I don’t blame him. But she did recommend that he wear braces on his ankles. So I consulted with the pediatrician before making that appointment. She laid Spencer on the exam table and moved/manipulated/rotated his legs. She called them “spaghetti legs”. She could move them in any direction. His muscle tone was low, but she did not think that was a huge cause of worry, he could build up the muscles. But she saw something else in his legs. “Beth, I want him to see a pediatric neurologist, I think he may have Cerebral Palsy”. And that was all I heard. She did talk me down (ish). She reminded me that if he did have it, it was not the end of the world, it was not a brain tumor (ok, an extreme example but she had a point). First step, ankle braces. So we made the appointment and Spencer was fitted with baby ankle braces. Everyone told me that these braces were a miracle and that the minute they were on, their baby walked. Spencer did not. (In his defense they measures the braces wrong and needed to redo them so he wore the wrong ones for a week or so…) Slowly, slowly, he started taking baby steps. But he still preferred crawling or being carried. And then, one day, with my heart in my throat, I watched my baby boy walk. Those tiny little dinosaur printed ankle braces changed our world. At 21 months, Spencer walked barefoot. He had full control, turned, pushed toys, carried toys. He was there. I tear up now remembering that day. With my mother-in-law in tow, we took Spencer to the neurologist. You know when you have those days where every detail sticks perfectly in your brain? That day was one of them. The neurologist pronounced my son (he actually evaluated both kids and pronounced them both) as “perfect”. He said Spencer did have low muscle tone but that he did not even need physical therapy or the braces. I kept him in the braces for a few more months anyway because I bought a new wider pair of shoes to accommodate them. When he sized up in shoes, he left the braces behind. My gorgeous, amazing, funny, cuddly, little man is perfect. He runs (not well and not fast, but he gets places faster than walking). He might not be a soccer player or football player but that will mean less concussions, so I am good with it. And one day, while waiting for big sister’s school bus, he jumped up in the air. Both feet off the group, jumped into the air. My baby boy. I have never been so proud. Really, when he plays with his friends you would never know what we went through in the spring of 2014. We still have some work to do though. He does not like stairs and prefers to be carried, especially when he is tired. When we hold hands on the stairs, he turns his foot inward and we want to work on that. When he moves to preschool, he will need to be able to walk down a long staircase to the playground and that staircase does worry me. But we will take it all day by day, step by step and now jump by jump. As a mom you would do anything for your kids, and if Spencer did have Cerebral Palsy, we would have researched and become the experts at CP. It was only a few months. And in the grand scheme of things, it was nothing. But it was also everything. I would check on him at night and put my hand on his back and watch him breathe and stroke his cheek and wonder if he would be able to walk without braces, if his peers would be cruel, how a disability might affect him and our family. We are so blessed that we don’t have to worry about these things. But if I ever do, I know that my support system is strong and I want to publicly tell everyone how fabulous the “how do you do it” group is. Because they got me through the beginning. They were a huge help in getting me from the emotional stage to the logical, research nerd stage. You need the emotional part. You need to cry when you get news like this, but you need to hit that research stage hard as well. Our lives are “normal” now (or as normal as life with toddler twins can be). When I take the twins down the stairs, I hold hands and lead them down one by one and that is our normal. I help Spencer turn his foot on the stairs and that is normal for us. But when he does not want to come inside, I chase after him and now that is normal too. And even while I am chasing after him, I know how blessed I am to have a baby boy who can run away from me, as long as he never ever runs into the street! Beth is known as mommy by a 6 year old and boy-girl twins who are almost 3. She blogs about life, kids, and DIY, at Pickles in my Tea and in my Soup. 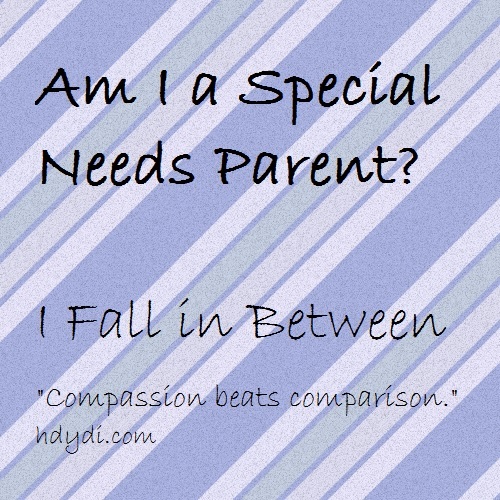 When you hear the term “special needs,” what do you think of? A child in a wheelchair, perhaps, or one fed through a feeding tube. Perhaps you think about someone who contends with dyslexia or autism. Now think of the term “gifted.” Whom do you envision? The star math pupil or the young inventor, most likely. The prodigal musician or child poet. Perhaps the star athlete falls in this category. The twice exceptional child is both gifted and has special needs. He or she is far beyond her years in one area while needing extra help in another. The twice exceptional child most likely to fall through the cracks is one whose giftedness may disguise their special needs or one whose special needs may mask their giftedness. It’s easy to categorize a child with an enormous vocabulary and incisive mind as lazy when they never complete their schoolwork, but what if, instead, they’re dealing with an attention deficit that has gone undiagnosed? The average child in a class may in fact be brilliant at math, but held back by dyslexia. 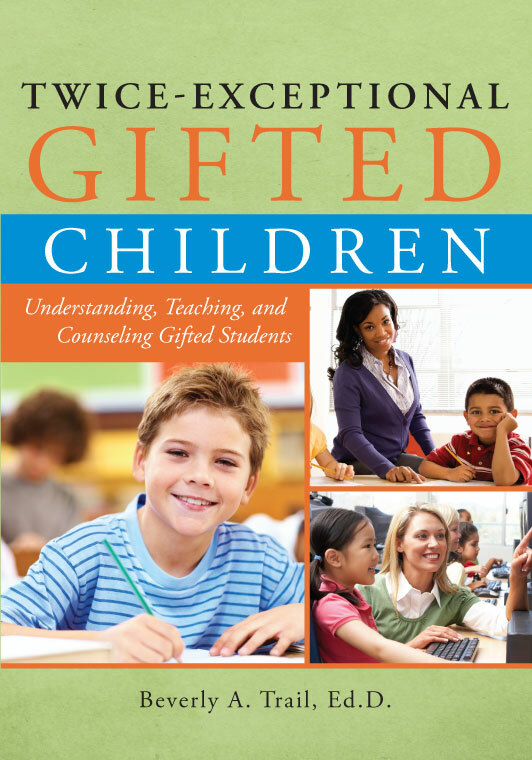 I had the privilege of attending a talk by Dr. Beverly Trail, author of Twice-Exceptional Gifted Children: Understanding, Teaching, and Counseling Gifted Students . She was hosted by the our school district’s gifted and talented program, and I learned a lot from her talk. My daughters were identified early as being gifted. Some might argue that my daughter M also has special needs. In addition to her facial cleft and all the social fallout from looking different, M’s anxiety can sometimes be paralyzing. Let this be a reminder not to pigeonhole the people you come across in one box or another. People are complex. A teacher friend of mine, Gloria, once told me that her approach to gifted children is to consider theirs to be just another type of special need. The gifted child needs personalized attention and education just like any other special needs child. I could have just kissed her for saying that, but I just hugged her instead. Do you know what my exceptional, possibly twice exceptional, 7-year-old did at the talk on twice exceptional children, which she attended with me? She went up to Dr. Trail after her talk and asked her why, given that her points were relevant to all students and teachers, only those affiliated with the district’s gifted program were invited. Dr. Trail told her that she’d been specifically invited to speak to this audience, but that she agreed that her content wasn’t just for us. She also told M that her question was a very good one. Because my child, like yours, is exceptional. Every so often, I come across a story that stops me in my tracks. Such stories remind me that what seems like a small gesture can change the path of a person’s life for the better. They remind me that it’s okay to accept help as well as to offer it. They make me proud to be human. The story of triplet brothers Leo, Nick and Steven Argel, and their mentor, Ollie Cantos, is one of those reminders. Go on, listen to it. I’ll be here when you get back. If you’re not able to listen to it right now, perhaps the transcript will work better for you. Done wiping your tears? I told you I’d be here. This story touches me on so many levels. Yes, there’s the obvious triplets thing. Thanks to my sweet twin daughters, M and J, as well as their triplet cousins, I’m a sucker for happy stories about multiples. That’s not all, though. I have the privilege to know an extremely well-adjusted, smart, sweet, highly energetic little girl who happens to be blind. She’s 9 years old and a role model to my daughters, both academically and socially. She recently took first place at our regional Braille Challenge. Several months ago, one of my daughters was driving a scooter on the sidewalk and not paying attention. Her blind friend reached out for the handles from behind her and turned quickly to keep both girls out of the street, then lectured my daughter on street safety. This little girl’s mother is one of the few NICU moms I know in real life. The grace with which she navigates single motherhood and encourages her daughter’s independence and self-advocacy is an inspiration to me in my newfound single mom life. 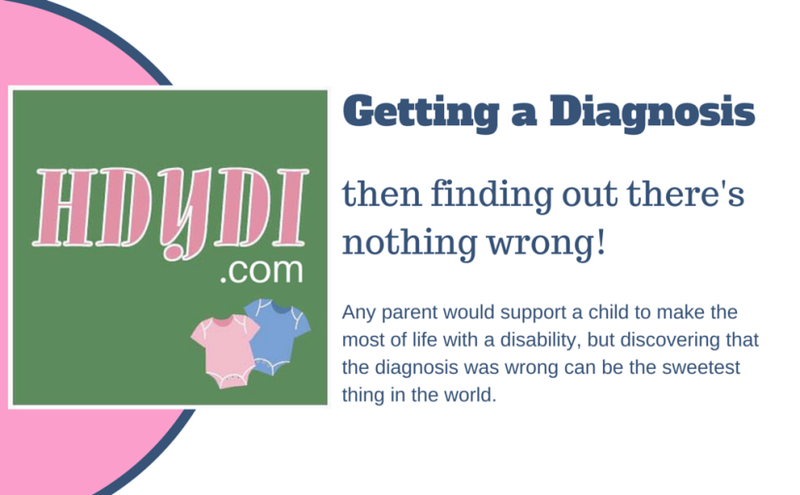 The matter of fact way in which she faces her daughter’s disability has been a model for the way I discuss my own daughter M’s birth defect with her. I’m fortunate to be in a position where I can provide for my children. However, I don’t do it alone. While I am well-equipped to feed, clothe and educate J and M, I lean on my church community for their spiritual formation. I know that Nick, Steven and Leo’s mom did her very best, but simply wasn’t in a position to know what her sons were capable of. I can’t imagine it was easy for her to let Ollie into her sons’ lives, putting in relief all the ways in which she hadn’t been able to nurture them alone. This is a story of love. It’s a reminder that family isn’t just a group that you’re born into, but one built on love and chance meetings. I am newly invigourated to not only to continue to deepen my relationships with children in my community who, for whatever reason, have crossed my path and been drawn to me, but to accept help from others in raising my own two daughters. Ollie Cantos: Same thing with you guys, right? Ollie Cantos: So, what were things like growing up? Leo Argel: Well, every day was like wake up, go to school, come back home, and then you stay there for the rest of the day. There were certain things that I wish I could do like go out and play in the snow like everyone else. ‘Cause I’ve heard kids through the window… we could hear that they were having fun. The only thing I remember when I was seven, we went to McDonald’s, and we went to the park. We rarely went outside. Nick Argel: It was getting so bad that I wanted to die. But it was one of the decisions I’m glad I did not make because I would have missed out on everything. 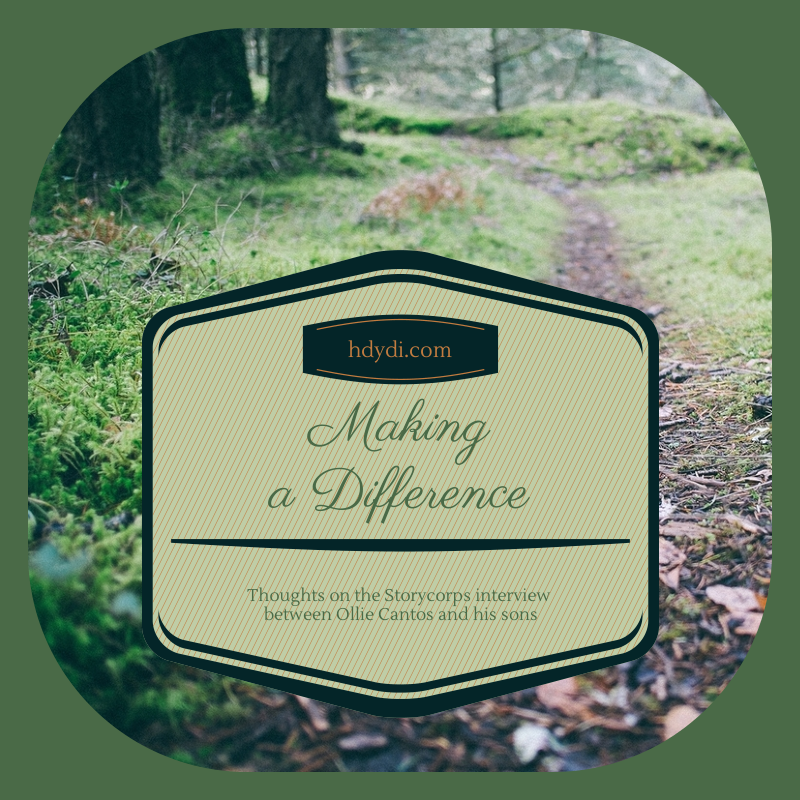 Ollie Cantos: Do you remember that night when I first arrived? Nick Argel: Oh yeah, I do. 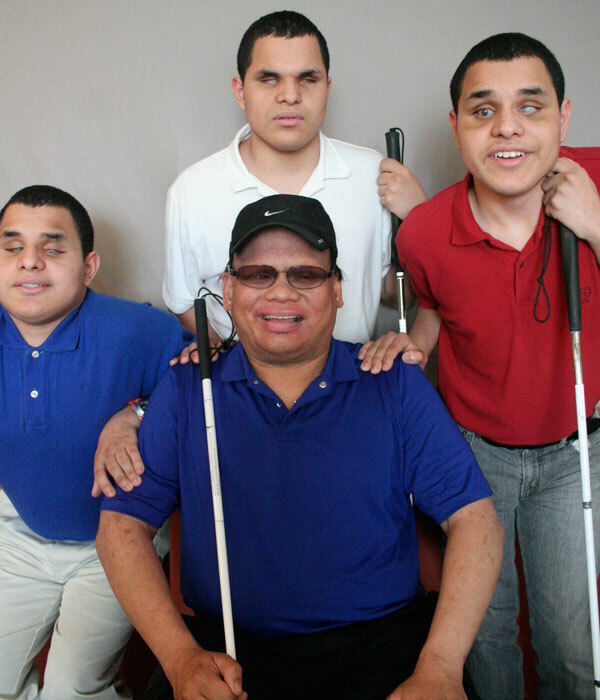 Because I… I certainly didn’t know that there were other blind people except me and my brothers. Ollie Cantos: You didn’t believe me that I’m really blind. So, I’m like, “Well yeah, here’s my cane.” And then you left and came back with a book, and you put my hand on it, and it was the Bible. You couldn’t believe that I actually read Braille. Nick Argel: It just made me feel like I had a person that I could trust, because I didn’t trust anyone. Ollie Cantos: I took you guys individually to learn how to use your canes better, and we’d just go to the corner store, and I remember, Leo, one day the store clerk, she said, “Is that your son?” And, you know, before I could answer, you put your arm around me, and you said, “Yeah, it’s my dad.” And I said, “Do you know what that means?” You said, “Well, you take us places, you protect us, you help us with our homework. Sounds like a dad to me.” Whenever I hear you call me “Dad,” it’s the highest compliment to me. You three used to be in the same situation that I was, and to see you come out of that and to be the way you guys are now, it’s impossible to describe how grateful I am that I get to be your dad. I am no sports fan. I managed to completely forget that the Super Bowl was yesterday until a friend pointed it out when I invited her family over to dinner Sunday night. I am, however, a fan of Derrick Coleman, player for the Seattle Seahawks (my daughters’ team, by the way, thanks to a Daddy and Grampy who are fans). I could probably write a ton about why it’s important for people in the public eye to show compassion and generosity. I could go on and on about how important is it to see people with disabilities in professions unrelated to their disabilities. I could go on forever about why it’s important to acknowledge the challenges faced by those with special needs while at the same time letting them know that they can accomplish great things. But the video says it all. So, be honest. Did you cry watching this too?